With over 50 species and brilliantly coloured flowers Laelia orchids have the added advantage of many varieties being cool growing. Laelia orchid species such as L. anceps and L. gouldiana are cool growing orchids closely related to Cattleya. However most Laelia orchid species require a brighter filtered light in a warm position. We think that they are underrepresented in Australian nurseries, perhaps they are a little more difficult to grow than some, however they do contain some beautiful specimens. Species include the very pretty pink flowering Laelia anceps (pictured) as well as Laelia superbiens, tereticualis, tenbrosa and rupestris. The blue and white flowering Laelia purpurata is rarely seen for sale, but well worth looking for. These are an orchid that will flower from autumn through to winter depending a little on the climate. Different species will have differing flower spikes, with some more flowers than others. 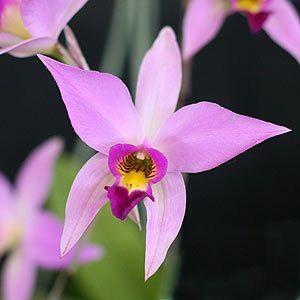 Laelia anceps is perhaps one of the easiest to grow and if you were a beginner we would recommend it as a starting point. Although it is also a widely grown form its flowers are attractive and colorful. In Australia temperature is not a problem in most areas, it is more control of light and moisture that needs to be monitored. Laelia Orchids are related to Cattleya Orchids. Partial shade and medium to low humidity provides best growing conditions for Laelia Orchids. This does depend on the species as they come from a range of climatic conditions. They grow in a range of climates from cool growing through to intermediate to warm. Plenty of water and fertiliser is the norm during the growing season, with less during the winter months. Laelia orchids do not like being disturbed, many growers tend to over pot to help overcome this. These are an orchid that like bright filtered light. 75 – 80% shade cloth depending on conditions and climate. Not suited to direct sun. Classed as an intermediate temperature type, they do come form higher altitudes and they do do prefer cooler winters. 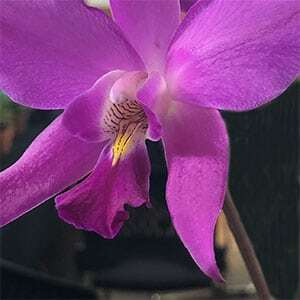 They are not an orchid that requires high humidity, and this makes them easier to grow than many others. When in active growth regular watering is required, during dormancy they need to allowed to dry a little. Twice monthly during active growth, use a liquid seaweed fertiliser. A specialist orchid fertiliser is also suitable. Laelia Orchids will flower throughout the year depending on species. Generally Laelia Orchids will flower from autumn through to winter. Laelia are roughly divided into two groups, the Brazilian ones and the Mexican ones. The first are large growing and are usually grown in containers. The second are smaller types, and can be grown in containers or as mounted specimens. Both ways, drainage need to be good, so growing medium should be open and free draining.